Based on the various shapes of our customers and over 20 years of dressing women of all ages one at a time, designer Jamak Khazra has perfected the fit and fabrication of Bluesuits pant collection. The collection offers several pant style to fit the various shapes of women from pants for pear shapes, pants for tall women, to pants for petite and petite plus shapes. Bluesuits pants are fully lined in a durable and comfortable lining that has mechanical stretch and moves with your body. The fabrication includes European Tropical Wools designed by Jamak Khazra and specifically custom made for Bluesuits in solids and pinstripes. You can also find 100% wool pants, velvet pants, cotton pants, pinstripe pants or pinstripe pantsuits, solid navy pants, black pants, charcoal gray pants. Shop for best fitting Flat-Front Pants, Side Zip pants, Wide leg Pants, Boot leg pants or straight leg pants. Whether you are looking for pants for petite women, pants for tall women or hour-glass shaped women, you can shop for them at Bluesuits. 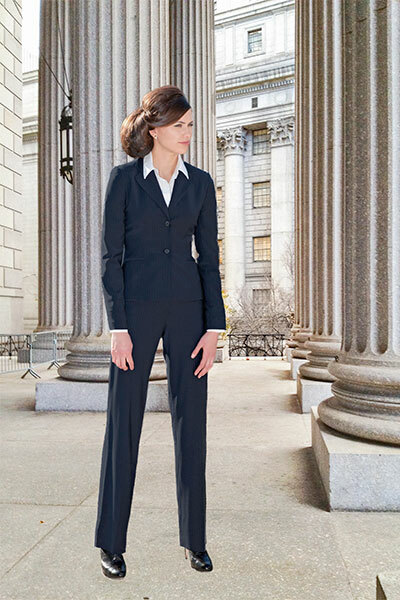 Bluesuits now offers custom tailored pants made in NYC for women If you are interested in ordering Custom pants you can make an appointment to visit us in our New York Showroom or fill out our custom request form and we will follow up with you. If you are a tall woman having trouble finding pants that are long enough for your long legs, Bluesuits ready made pants have a 35" inseam or the pants can be custom made to fit your exact measurements. Bluesuits Wide-leg Pants are fabulous for women who have athletic legs and need a wider leg, or women who have an hour-glass shape since the wide-leg pants balances the wide hips by not accentuating the hips. Bluesuits wide-leg pants have a very clean hip slimming waistline, are fitted through the buttock and hips and the legs are just wide enough to disguise the thighs and fit just below the natural waist. The result is a long, lean and slim look. Bluesuits fly-front wide leg-straight leg pants P3371 and Bluesuits Zip-Front Flat-front Wide-Leg Straight Leg Pants P3370 fit every shape. These pants are also very versatile and can be worn with a sweater, shirt, jacket, in corporate offices, in the evening with appropriate jewelry and heels or casually around town. They are also the pants to wear on business travels. We know we know, you have been looking in the market for pants that are professional looking and can be worn to work, you don't want your underwear to show when you bend and you are tired of looking like you are wearing your younger sister's or worst yet your daughters pants. At the same time you don't want to look outdated. This is the reason why bluesuits pants all fit just below the belly button so while the waist on all Bluesuits pants are high, they are modern and stylish and perfect for professional women of all ages as well as any woman who is looking for the best fitting high waist pants. Our pants give you enough room for your hips so even if you have an hourglass shape all Bluesuits pants will fit you. All Bluesuits pants fit about 1 inch below the belly button. Bluesuits Flat Front Side Zip boot leg Pants are made in stretch fabrics, our customers love these pants for work or to wear with a suit jacket. Style P3374, these pants are available in tropical wool stretch, cotton stretch or poly stretch. These side zip pants are also slimming and flattering. The waist sits just below the belly button about one-inch below and is perfect for women who don't mind showing their figure. On the other hand we have found that these pants are also flattering on full figure or hourglass shaped women because the boot leg style lye or the wide hem balances the hip much like the wide-leg pant style. By far the best fabric any professional woman can ask for in business pants is tropical wool stretch. Bluesuits tropical wool stretch pants are made with European Tropical wools and are the perfect work pants as they are very comfortable and they do not wrinkle so Bluesuits pants for women are also great for travel. All Bluesuits pants are fully lined. Bluesuits signature lining for pants is our best kept secret. We use a special lining for our pants that provides utmost comfort and is not bulky. Our pants are also quite long and even women who are 5.9" or 6" can wear them. You can also customize the pants by choosing your fabric of choice, length and fit. just make an appointment to try our various pants. One of our most popular pants especially for the cold weather is our 100% wool pants. They are available in many fabrications including wool tweeds and double faced wools as well as tropical wools.